Explore Costa Rica's Most Beautiful Region with a Hike through the Forest! Once surrounded by lush dense rainforest, Arenal Volcano erupted in 1968, when three craters burst open and covered the area in lava. Almost forty years later, the forest re-energized and is now a protected national park spanning over 26,000 hectares. 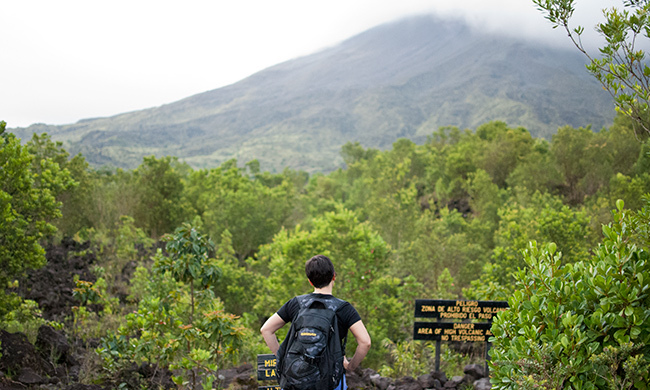 While hiking through Arenal Volcano National Park, you can enjoy a great array of wildlife such as howler or white-faced capuchin monkeys, deer, tapirs, and snakes, and birds like mot mots, parrots, orioles, and brown magpies. There is a wide range of plants growing in the area including various species of palms and bromeliads (including the endemic specie Pitcaimia funkiae), bait, ceiba, cirri, laurel, higuerones, fungi, orchids, and ferns. On a clear day you will have great views of the Arenal Volcano, Arenal Lake, and the neighboring 3500-year-old extinct volcano Cerro Chato. This excursion is a great way to enjoy some spectacular sights while learning about the natural history of the area. Hiking is intermediate/difficult level and you will experience gravel and loose rock on the lava beds. Your tour includes: Transportation from/to your hotel, park entrance fee, certified nature guide, water, material with supporting information. What to bring: Hiking shoes, comfortable clothing, raincoat, sunscreen, repellent.